A couple weeks ago, the Monogram team was contacted by an amazing designer, Nancy Blandford. She shared with us a recent kitchen remodel that she’d just completed with Monogram. Her design work was so beautiful that we had to feature her on our blog. Check out Nancy’s designer profile and learn more about her business, Built In Design. Next week, we’ll talk to Nancy more in-depth about her recent kitchen remodel. Stay tuned! I grew up in the 70’s loving to create. I made clothing out of old jeans and flour sacks, repurposing before it was cool. I also loved to paint and draw. I wanted to go to art school, but my parents had a home furnishings store and pushed me to go into Interior Design. Looking back, I am happy that they led me that direction. I have never grown tired of helping my clients discover their design aesthetic. I believe it is important to first get to know my clients and how they use their space and then design something unique that works for them. SRFD: Tell us about your recent kitchen project. Most of my work is from referrals and from projects I have posted on Houzz or Pinterest. I had a client recently contact me from projects I had posted on both sites, and she hired me to do her lake house. I was her “boots on the ground” while she was back home. We had weekly FaceTime meetings so that she could watch the project progress. She would pin photos of things she liked and wanted to incorporate into her kitchen. I would send her sketches of different options, and together we designed her space. She described her style for this home as “Country French”, but not shabby. I would relabel it as “Elegant French”. I took her clever angled 1980’s kitchen and cleaned up the lines. Since the kitchen was front and center in the dining living space, it needed to fit in and serve without dominating. SRFD: What’s a design trend you’re over? Her existing kitchen was the epitome of passe` design! I am so over angles just for the sake of angles. I am also over orange wood tones. SRFD: What’s a design trend you’re excited about? I am excited about the options appliance manufacturers are coming up with. I love, love, love the Monogram 30” Integrated Refrigerator! I was able to put two together and give my clients what they needed for food storage, and it looks like a beautiful piece of furniture. I also like microwave drawers, being able to hide it somewhat. Now if someone could engineer a microwave with a panel front, and while they are at it, make a reversible hinge door. Following up on last week’s profile of photographer and designer Jamie Sangar, we wanted to learn a little more about her background and most recent project – her own home. As a little girl, I never imagined myself being a general contractor. General contractors carry tape measures and wear hard hats. I was going to wear tutus and make-up. In my wildest imagination I never guessed that general contractors could do both! When my husband and I decided we wanted to build a modern, energy-efficient home in Indianapolis, Indiana, our options for homebuilders were pretty slim, to say the least. In a market with much more conservative taste overall, and neighborhood homeowner’s associations that have a tight hold on architectural styles, the challenge was real trying to find the perfect land that would allow us to have neighbors, since we aren’t the country-dwelling type, as well as the design freedom to build a modern home. So, before even getting started on the land search, we knew we were up against two major roadblocks. Thankfully, we were pleasantly surprised to quickly find the perfect land. It’s as if fate was on our side. We knew that our next step was to find the perfect architect. Even though we are both artists (my husband, a Visual Effects Supervisor, and me, a photographer by trade) and can easily visualize and design things on our own, we put the upmost value in hiring an architect, that could not only design a functional home based around the way that we live, but also, build a home that fit the land. We lucked out with lots of tall, mature trees, and a hill that our house would set atop—all things that we wanted to help dictate our home design, rather than knock-down, flatten, and plop a house on top of. After meeting with three different architects, we chose to work with Jason Wolfe at Demerly Architects, who was the perfect match for us in terms of style, personality and being willing to work with, what some would consider, a tough budget for a custom home that offers some high-end technology and appliances. He had ideas on where to save money to help offset those luxuries we weren’t willing to give up. After having our plans priced with two local builders, and feeling frustrated by the price that came back both times, we decided that if we were going to make our dreams a reality, we were going to have to get our hands dirty. And by “dirty,” I mean, take on the responsibility of being the general contractor on our build. I managed the day to day progress, scheduling the sub-contractors, managing material deliveries, working with our lender, meeting with potential subs, getting quotes, keeping the job site clean, hiring and firing, all while managing a full-time photography business and two children. Our exterior walls are SIPs panels (structural insulated panels) built by Thermocore, which means that not only is our home very insulated and energy-efficient, it meant that our walls were built indoors in a factory, unexposed to the weather elements, and then delivered on two semis to the job site. A crane and a framing crew would then set the walls, which drastically cut down on framing labor and time. So within days, our home had a roof and we were ready for the rough-in stage. Next was the fun part. That’s when all of the finishes and final design came into play! I knew I wanted to be minimal but warm and inviting, sleek but introduce textures, and add pops of color through furnishings rather than with wall or tile colors. The palette was simple; white walls, polished chrome finishes, black windows and maple hardwoods. The most important room to us was the kitchen. I love hosting, cooking and entertaining, so our main “splurge” was our kitchen appliances. An example of finding ways to offset the cost of our commercial-grade kitchen “must haves” was to design and build our own cabinets from Ikea. Ikea’s white glossy lacquer cabinets were the clean and efficient look we were going for! I’ve always had a passion for interior and architectural design. It’s just something that’s in my blood and I’ve followed for years through social media outlets, magazines, and in stores. But the most fun and applicable way for me to put that knowledge to use was by building our own home. With this home, unlike our last home, I wanted a clean and modern neutral palette. Our last home had lots of color incorporated by different colored painted walls. My plan with this house, however, was to incorporate color with furnishings, while keeping the floors and walls neutral. This has allowed for a consistent look and feel throughout the entire house, while each room has a unique flair based on the furnishings. I especially have a love of mid-century modern design, so while our home is brand new, those same ideals were used in the design of our home. The idea that large expanses of glass be used to bring the outdoors inside, with a large open floor plan concept, we’ve topped that idea off with lots of mid-century modern furniture and decor. Another goal with the design of the interiors was to be as minimal as possible, while still being comfortable. An example of this is designing our closets so that our dressers fit inside there, rather than in the bedrooms. This allows for more floor space and less surfaces that likely end up finding clutter, and not to mention, dust. We also chose wall-mounted vanities in every bathroom to give the illusion that the rooms are larger than they are, by being able to see the floor underneath. The same is true for our master bedroom with floating nightstands. From an exterior standpoint, we chose a front door that is one that you would’ve seen in the 1950s, and we chose to make it orange, to contrast our two-toned grey siding. Now that we’ve gotten comfortable in our new home, I decided to carry on with my design passion, and start Mod Abode. I view Mod Abode as a blend of all of my passions; photography, design and architecture! It also gets me involved in a social media community that shares those same interests. I get to take pretty photos of design elements and credit those who are responsible for designing or carrying such cool things in their stores. I am not quite sure where Mod Abode might lead me, but my hope is that new doors open that let me expand upon the things I’m always eager to learn more about. The Monogram team came across a photo designer and photographer Jamie Sangar shared on her Instagram account earlier this year and were so impressed by her design aesthetic, we needed to learn more! Today we’re sharing Jamie’s path to design and her company, Mod Abode. Next week we will feature her gorgeous kitchen. Jamie: Regardless of whether you believe in the myth of people being either right-brain dominant or left-brain dominant, I think we can all agree upon the fact that some people are just born with certain talents. Everybody has their own unique talent, but it’s up to them to discover it and apply it in a real world scenario. The definition of “talent” is “natural aptitude or skill.” In other words, someone was born that way. I have always loved design for as long as I can remember. My style preferences weren’t learned from my parents, it’s just something that I always had a flair for. It wasn’t until after college, where I graduated with a Marketing degree from Miami University, that I got to professionally enter a creative environment. First starting my career in advertising, where I was an account executive for big brands, acting as the middleman between the artists and the client, I got my first taste of the creative world. The environment was awesome to be a part of. Halfway through my 3.5 year stint at the ad agency, I started a photography business on the side. After seeing quick growth and repeat customers, while also consistently gaining new customers, I realized that there just weren’t enough hours in the day to complete both jobs at 100% effort. So I decided to take a leap of faith and pursue my photography career full-time. That was 11 years ago and I couldn’t be happier to be making my own rules as I go, meeting new clients along the way, and continually surrounding myself with creativity! That interest has always been there from an interior and architectural design standpoint, but I never tried applying it professionally. So, I thought, what the heck, and Mod Abode was born. It is a blend of all of my creative passions; photography, design and architecture. I get to take pretty photos of design elements and credit those who are responsible for designing or carrying such cool things in their stores. I am not quite sure where Mod Abode might lead me, but my hope is that new doors open that let me expand upon the things I’m always eager to learn more about. Jamie: The number one, most important room to me, as we were designing and planning the build of our new home, was the kitchen! 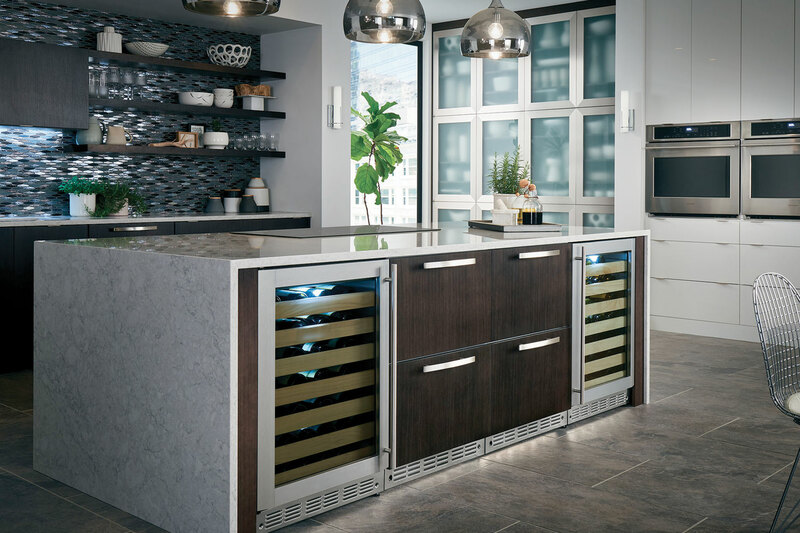 I love cooking, hosting and entertaining, so I wanted to put a lot of thought into the layout, the design, and most importantly the appliances and technology! Because we were working with, what some would consider, a tough budget in the custom home realm, we knew that the build process was going to be a relationship of give and take. Aren’t all solid relationships about give and take?! We knew that we weren’t willing to backdown on the commercial grade appliances that we had researched and tested-out, so an example of a “give” was to take on some of the kitchen building labor, and build our own Ikea cabinets. They were always the look we wanted, white and glossy, but sure, we could’ve saved ourselves a bunch of time and effort if we had gone with another custom (expensive) brand. But that was one example of us not backing-down to what we felt was important in our kitchen. We chose a Wolf induction cooktop, a Wolf wall oven, a 48” Subzero refrigerator freezer, and a Monogram Advantium wall oven! While the kitchen is not huge, it is very functional for the way that we live in it. It is also designed with 180 degrees of window views overlooking Geist Reservoir in the distance and woods to the side of our property. Not only does the daylight keep the kitchen bright and airy, but the beautiful views help create a warm environment, for not only us, but our friends that we enjoy hosting. Jamie: I almost hate to point-out a trend that I personally do not gravitate towards, because I know that many people don’t prefer my taste. (So, feel free to punch holes in the way I like to design, ha)! However, if there’s one trend that I feel has been used over and over again for years, it’s gotta be the distressed, eclectic, shabby chic look, with mismatched furniture, mismatched fabrics and patterns, combined with distressed everything! Not a trend, but a style I obsess over, is bringing the outdoors inside. In fact, that’s a really old idea of mid-century modern style. If you’re remodeling an existing home, you’re definitely limited by window size if you’re not into cutting larger window openings, and making sure appropriate engineering and headers are in place. However, there are some things you can do to help achieve more of this look without a hefty price tag. Simple things like removing the grilles from your windows will completely open up the room and give the illusion of letting more light in. If you have the opportunity to buy new windows, consider something like casement windows that allow you to open up to the outdoors. Consider brands with small, minimal trim/mullions to keep the look minimal, but the daylight to a maximum. For new construction, it’s definitely easier to plan for these types of things. Think about incorporating a large window expanse towards a pretty and private part of your property. Higher-end window brands have even engineered moveable window walls, that actually allow you to open up to the outdoors, making you feel at one with nature. So while this is certainly not a new trend, it’s one that I feel should be placed at the top of the “must have” list!